When I was three years old, my parents took me on a vacation to Atlantic City. It was my first time ever to see the ocean, and my parents were excited to see my reaction at seeing the water when we arrived at the beach that morning. Although I don’t remember the experience, I’ve been told that when I first set foot on the beach, I had a very concerned look on my face when I saw the waves pounding the shore. I ventured closer to the water to get a closer look, and upon surveying the incoming waves, I promptly turned on a dime and outran my parents back to the hotel without stopping. When my parents finally caught up with me to find out the reason for my distress, I said, “the river came out of itself,” in awestruck horror at the ocean’s power. 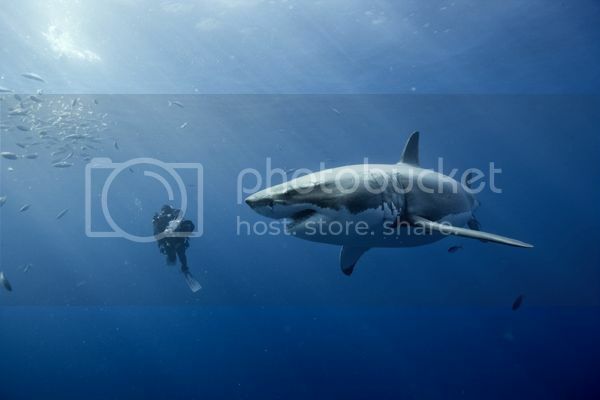 A great white shark is far more tempted by the small fish than a human diver swimming alongside him in a scene from Oceans. Oceans, a DisneyNature documentary premiering in theatres on Earth Day, April 22, 2010, opens on a similar theme of childhood wonder as a little boy on a beach stares out at the vastness of the ocean before him and wonders what an ocean is. As children, before we learn names for what things are called, and prior to learning about taxonomical categories in biology courses, staring at an ocean and all of its inhabitants is truly an exercise in wonder. Oceans ignites that childlike wonder while exploring the richness, beauty, danger and primordial nature of the sea. Directors Jacques Perrin and Jacques Cluzaud clearly have a knack for inciting wonder. Perrin directed the acclaimed The Winged Migration in 2001 and Cluzaud’s resume features work in IMAX films and innovative projection techniques. Disney launched the DisneyNature label after the worldwide success of March of the Penguins in 2004. Their mission is to release one nature-related documentary per year to raise awareness about the interconnectedness of humans and nature, including what actions we can take to positively impact the environment. It is promising to see a global media corporation as hefty as Disney champion sustainability in a serious way. And it will be clear to anyone who sees Oceans, a top-notch production with stunning cinematography, narration and musical score, that Disney spared no expense to produce this film. 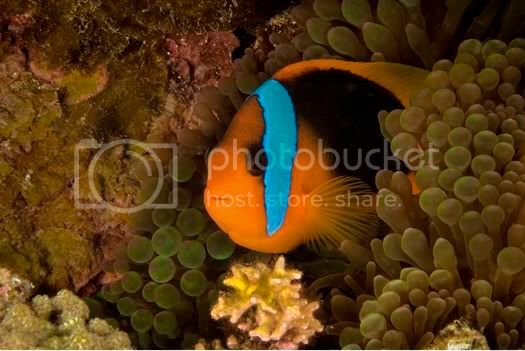 This clownfish in his natural environment is just one of many breathtaking examples of how vibrant and vivid our undersea environment really is. In one of the film’s most breathtaking sequences, we witness a school of sardines massacred from above and below by an army of birds, dolphins, sharks and blue whales. The sequence is an orgiastic feeding frenzy, shot from above, on the surface and underwater, accompanied by a kinetic musical score. The different animals in this sequence appear so choreographed that they invoke the ballet of dancing hippos, ostriches and alligators from the “Dance of the Hours” sequence from Disney’s animated Fantasia masterpiece. The sequence ends with a blue whale breaching the surface in the center of concentric rings of dolphins, fish and birds, a prima ballerina taking her bow. Oceans is primarily a love letter to our world’s oceans, surveying the various topographies and lifeforms of the world beneath the surface that we often take for granted. Fortunately the film doesn’t shy away from discussing the danger that human activity poses to oceans. Although Oceans was never intended to be a hard-hitting piece of environmental journalism, it does strike a good balance between education and advocacy. The film highlights how advances in satellite imagery allow us to see where industrial pollution flows from rivers out into the open ocean, much the same way a calcified artery might appear on a heart scan. In a regular satellite photo, the river appears to be as blue as the ocean, but when the view switches to the new technology, the pollution in the river, heretofore unseen, materializes in the photo as a black, foreboding stream. The oceans have become humanity’s dumping ground for hundreds of millions of tons of trash each year. In another sequence, we see gigantic fishing nets that sweep vast swaths of water, a practice known as trawling, decimating global fish populations and killing other animals unlucky enough to get caught in the vast net. And in Antarctica, we are shown how rising global temperatures have resulted in the demise of the polar ice caps. Though the film doesnt broach the topic directly, human water consumption is another imminent crisis facing our oceans. In a brilliant editorial, National Geographic Society chairman Gilbert Grosvenor discusses how human water usage is unsustainable and touts a National Geographic issue devoted entirely to water. (Download here.) Towards the end of Oceans, Brosnan boldly (and correctly) states that the greatest threat to the ocean is human indifference. We hope that you attend, absorb and engage in activism, even at the most basic levels to prove him (and all of us) wrong. Coinciding with the film’s release, Disney has launched a campaign, in partnership with The Nature Conservancy, to create a protected area of coral reef in the Bahamas. Each moviegoer who attends an Oceans screening in the first week of the film’s release will help contribute to the cause. The campaign for the previous DisneyNature release, Earth, resulted in the planting of an astonishing 2.7 million new trees in the Amazon rainforest. The Nature Conservancy, founded in 1951, protects more than 119 million acres of land, 5,000 miles of rivers, and 100 marine conservation projects globally. With a staff of more than 700 scientists, they pursue their goals through science-based, non-confrontational strategies. 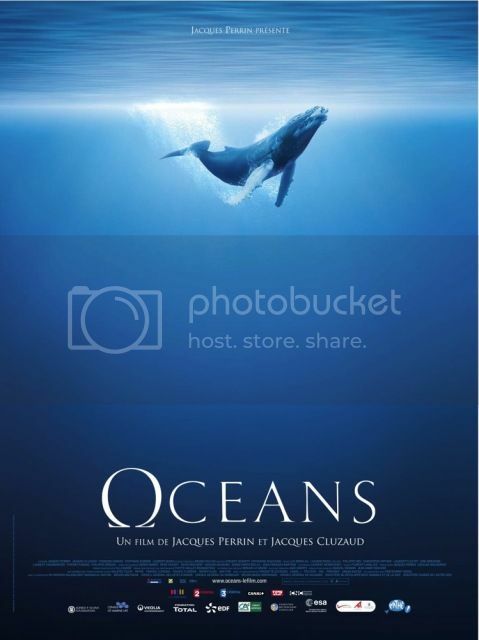 Oceans goes into wide release on Earth Day, April 22, 2010 at theatres nationwide. Contact your congressional representatives to voice your support for the Oceans-21 Act: a bill that adopts the key recommendations of the U.S. Commission on Ocean Policy and the Pew Oceans Commission to develop a holistic ocean health plan. This bill, unlike past ocean legislation, treats the disease, not the symptom. Educate yourself about the sustainability of seafood. Check out “Bottomfeeder: How to eat ethically in a world of vanishing seafood” by Taras Grescoe. Volunteer or donate to ocean related organizations. If you live by a coastal area, attend a beach clean-up. Support elected officials who support the ocean. Keep trash out of the oceansif you don’t already, recycle, reduce, reuse and compost as much of your waste in your home and office as possible. Earth911.com is an exceptional resource for tips on recycling, finding ways to be greener, reduce waste, and purchase products made of recycled materials. Have more ideas for us? We’d love to hear about them in our comments section.